No matter how you define it, engagement is something that we most likely underestimate. Engagement symbolizes the touches that occur in various moments of truth and this should completely change not only how you engage someone in each moment but also how the inside of your company works with one another to make it frictionless and experiential. Whether a customer stands on the stage of awareness, consideration, purchase, or post purchase, touch points open and close. And, it is in those moments that engagement, regardless of source or shape, affects the next steps and impressions of customers. These moments of truth however are not limited to any one channel. Whether customers are navigating social, mobile, web or IRL (in real life), they approach each stage of the journey with different needs, in varying stages of decision making, and with one of several frames of mind depending on the context of engagement and also the screen (smartphone, PC, tablet, TV, etc) they’re using in each moment. It’s becoming increasingly complex, but then again so is the path of consumer decision-making. That’s why I wrote WTF, What’s the Future of Business…someone had to tell the story of the new customer journey, their way points, and how to reach them. The answers revealed that social was only part of the adventure. The image above represents a detailed customer journey map, which outlines the important steps your connected customers take during and following decision making. The map also introduces the diverse elements that factor in to each step. Perhaps more importantly are the channels and screens individuals use to make their way along the journey. Mobile, social, web, IRL, they each contribute to a customer experience that either helps or prevents them from moving along in your favor. In my research I’ve found that more often than not, each stage of the customer journey along with the mixed channels that they use are defined or programmed by different groups within the organization. The social experience is developed independently of the mobile experience, which is disconnected from the web experience. The point is that customers only see one brand or business and therefore each channel should complement one another to deliver against a desired experience and journey optimized for the moments of truth and for the context of each screen. One of the ways I’ve defined “engagement” over the years was quite simple, when a business and consumer interact within their channel of relevance during various moments of truth. Engagement though, is then measured by the actions, sentiment, and outcomes that result from each interaction. To optimize results, experiences, click paths, outcomes, and sentiment must be defined and enlivened through each channel in each moment. To do so takes vision, articulation of that vision, and collaboration with all stakeholder groups to cast a unified approach. Yes. It’s the age-old argument of bringing down silos and opening doors between departments and groups that just don’t talk to each other right now. But, that’s just what needs to happen and the more progressive companies are already taking note. One such company is one that you’re more than familiar with. Starbucks recently appointed Adam Brotman, former senior vice president of Starbucks Digital Ventures, was appointed to an entirely new executive role, chief digital officer. The CDO role assumes all of Starbuck’s digital projects, which includes web, mobile, social media, digital marketing, Starbucks Card and loyalty, e-commerce, Wi-Fi, Starbucks Digital Network, and emerging in-store technologies. Sephora is another forward thinking company that is uniting disparate channel strategies and various customer journeys in the name of holistic experiences. Sephora recently underwent a makeover to define the ideal customer experience and how it would play out in digital and real world channels, including in store engagement, while complementing and optimizing one another. Perhaps a Chief Digital Officer is just the beginning. What we’re really talking about is someone who can bridge marketing, sales, service, and technology to create a frictionless path between customers and the business…at every step of the journey. Perhaps it’s time to think about escalating the role to someone who can own the entire customer lifecycle and bring the people within the organization together to do it. To break down walls, someone must be able to show how and why everyone can and should work together and also what’s in it for them. It would take someone who isn’t tied to any one function but instead someone who has everybody’s best interest inside and outside the organization to redefine the experience and how it’s formed and sustained. As I write this, I imagine someone taking over the role of customer journey management for digital, social, mobile and IRL. The digital lifestyle is just a way of life now and businesses that don’t think beyond social or traditional will miss the greater opportunity to lead desirable customer journeys, experiences and outcomes. 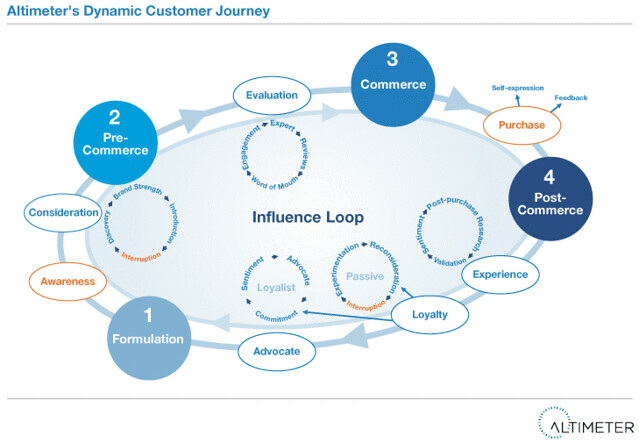 Take one more look at the Dynamic Customer Journey. As you plan for 2013 social, mobile, digital, and other channel strategies, consider how each can converge into a reciprocal and congruous ecosystem. The future of customer experiences lies in experience design and more importantly, customer journey mapping…across the screens and IRL. Welcome to a new world of customer journey management (CJM) and the ability to bring people together around a common vision for improving customer experiences, sentiment and relationships. Good points, Brian. Consumers don’t separate their experience into a website bucket, a social bucket, an in-store bucket. To most people, it’s all one experience and both the way we think about the customer journey and our internal structures should reflect that continuous experience. Companies have long examined and analyzed customer engagement points on the properties they wholly own (website, product, app, etc.). But engagement on social channels has been mostly regarded as mere navel gazing simply because it’s more difficult to make a direct connection with engagement data on these “rented” properties with sales data. As the technology (and quite frankly, the strategy) improves to allow marketers to make these connections more directly, I think you’ll see more holistic thinking like you’ve outlined here. With most companies, they only believe what they see and what they see has to fit into a spreadsheet. Wonderful comment Erica and spot on. Thank you for sharing! Great breakdown of Customer’s Journey. I look forward to the following piece. I also enjoyed your examples of companies that have shifted from digital engagement. These companies are all groundbreaking leaders in their respective industries. I definitely agree with your points of a customer’s journey. A lot of times company’s don’t understand how or where to reach their target market. Most company’s believe that the consumers journey begins with advertisements, and ends with their bottom line. Case in point the consumer making a purchase. Of course they want repeat purchasing from that consumer, but they fail to engage the consumer with all the outlets to make that consumer a repeat purchaser. As you stated each company has to have their own way of channeling the consumer at each spectrum of digital media. Its not all about how you engage with the consumer as they come into your place of business, but how you engage with them to make them come into your establishment. Also how you engage them to make them repeat consumers. As we get more into the digital age, we as company’s have to start marketing our brand and company’s not only in a social way, but it has to be digital and social as well. Great blog, I really enjoyed it! There is such a great opportunity to use socially available data to improve the engagement with the customer in the post-purchase segment of the journey. With so much focus on leveraging social on the marketing side of the business, I wonder if we are overlooking the value of knowing the customer through social data analysis when that customer calls the contact center. Every contact handled by a CSR is a chance to develop a raving fan…they just need the right toolset to understand who they are talking to. We are indeed overlooking the value across the entire journey…but it all starts with the experience. I agree that engagement is now key in promoting a brand, and today that engagement is evolving into a hybrid form that leverages personality of the brand, the human nature of their organization as a whole, and all of the channels available, digital and analog. As you navigate this landscape, the only thing that I find perhaps a little disracting, is the wholly new vernacular and sets of acronyms you have developed to describe the process. Do you feel that marketing professionals need a new language to describe these interactions appropriately or is the vernacular meant to help the reader to “break” their traditional thinking and create a mindset of new learning? Has anyone else given this feedback? I always deconstruct your language, and apply the great concepts to language I already know well and use daily, as opposed to employing the new lexicon here. It just seems simpler. A great article about how we are moving from social to digital…and how to not only engage in it, but embrace it. Thanks! Thanks for continuing to articulate the constant changes in social marketing and helping us see where things are heading. I’m actually starting a new job with an A16Z stealth startup in a couple days, heading up their social and engagement marketing. One of the things I’ve already been talking about with the CEO and VP of Marketing there is how we need to be prepared to provide meaningful interactions throughout the customer experience, wherever that takes place. It can’t just be about demand generation, point of purchase and support. Showing that you are ready to engage at any step with a robust experience is key. And the customer journey you discuss provides many opportunities for measurement. To your point, the type of role you are talking about is still emerging, but I am excited about joining a company that is encouraging me to look at engagement across mobile, web, product and more! Keep up the great work Tony! Thank you for writing this, Brian. I’m currently working at a company that is just beginning to realize the benefits of establishing a solid social and digital presence. As a business that primarily relies on the word of mouth references, having a person in charge of managing all of the engagement with customers in the social/digital sphere as well as IRL is something we’ll have to definitely look into doing for our company. You touch on some very insightful points for more businesses to become better acquainted with this new digital frontier. I really appreciate this! Thanks for reading and commenting Kirby! Hi Brian, Thanks for this insightful article. Your comment regarding C-Suite is spot on. I spend my time advising and explaining what ‘specialists’ in Digital, Brand, Social Media etc. are actually talking about, to Senior Management (who don’t want to look foolish by asking what the latest acronyms and trendy terms actually mean). I speak in Business English; avoid acronyms; drop drop the term ‘social’ and focus on how effective digital media can be in engaging with customers. I’ve found a fair amount of resistance from traditial marketing and media companies who still want to focus their resources on outbound, keeping separation from inbound. Thank you for your article Brian. Customer Journey Maps have been in existence for quite sometime. Both Harvard and Stanford have done extensive work in this area. The General Electric MRI adventure series machine is a classical example of brilliant Customer Journey Map development. Your suggestion of connecting all the dots that are part of a customer experience journey under the leadership of a CDO seems like a monumental task. Are you referring to a higher end version of a community manager? Just curious to know more in detail what the role description of a CDO would look like. Brian, My market is working with small businesses of less than 5 employees. The strategies you are talking about seem to be focused on larger brands. Do you feel that a small business owner can benefit from a total digital sales funnel without spending all their time or money developing and running the systems needed? Steve, I don’t know if the answer is black and white. I do believe that it helps as consumers are becoming more digital every day. Depending on the business, there’s a good chance that it has to find a balance for now. Brian, I agree, the dilemma is trying to find balance at the speed of digital. Perhaps the answer for small business owners is to spend more time finding where their customers consume most of their content and focus efforts in a smaller pond. This is great – the next part of the digital transition! Marketing is going from push to pull, now Sales needs to scrap the sales funnel and accept that the Customer Journey is not a funnel but actually a round-about that the prospect can join or leave at any stage! Also this solidifies the arguement that content marketing is not a campaign tool, it really is a major element for a new cross-corporate culture! It has become more obvious in the past year that segregating your online marketing into separate segments to cover different online channels is no longer going to work. The internet has become much more holistic with solid connections between these channels now and internet marketing professionals have to be just as integrated. Engagement is a broad digital action now not just a ‘like’ on Facebook or a comment on a blog. It is a concert of these things and more. Great piece, Brian! Very helpful. Thank you for sharing! 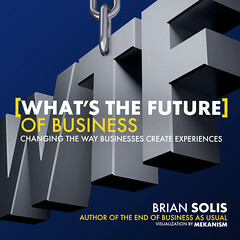 @briansolis:disqus , thanks for this great article. You are a great inspiration for me and I think many others. When working for my clients, I’m using the customer journey to create a walking path which leads to sales. Influence / ambassadors is one of the phase I really love.